The latest additions to the Thecus line offer significant improvements in performance thanks to their high quality processor, the Intel® Pentium® G850 Dual Core CPU, and 10GbE technology.Along with a 75% faster (yet cooler running) processor, newly incorporated multimedia ports (HDMI and VGA), and the inclusion of USB 3.0 ports, the new N7710-G and N8810U-G also bring the wealth of the Thecus App Center to SMB businesses. With their power and connectivity, both units allow many users to enjoy the endless features of the growing list of over 90 official and third-party applications. But how does all of this help your organization? Let’s take a closer look at the units’ key capabilities. At the heart of NAS development has been their ability to store and safeguard data. With RAID 0, 1, 5, 6, 10, and JBOD available, users can choose their perfect balance between performance and redundancy. Given their ability to host numerous drives, both NAS can benefit from the balanced strengths of RAID 50, while the N8810U-G can even employ the enhanced reliability of RAID 60. And to ensure that your data is transmitted and stored corruption-free, both units also come equipped with advanced ECC RAM, which is able to detect and correct single-bit errors – an essential feature for scientific and financial computing. But what about external threats to your data? Thanks to free copies of Acronis True Image and McAfee Antivirus, your data can easily (and even automatically) be backed up to local and remote media all the while remaining spotless thanks to McAfee’s advanced scan algorithms. Also, Thecus’s AES 256-bit RAID volume encryption tool allows users to fully encrypt their entire RAID volume, defending essential data even in instances of theft. Without knowing what tomorrow might hold, you want to be sure that no matter what your costs are low and your performance high. With the help of the User Quota feature and iSCSI Thin Provisioning, you can rest assured that your storage is shared efficiently amongst all users and that wastage is a thing of the past. And with the N7710-G and N8810U-G’s VMware V5.5 certification, you can rest assured that your NAS is compatible with the latest virtualization technology available. Being prepared for a changing business landscape means being able to adapt, and with the inclusion of an HDMI output port and 10GbE port,your NAS will be ready to connect directly to a variety of screens and projectors while delivering network speeds up to 10x faster than regular gigabit connections. In fact, the 10GbE solution offered by the N7710-G and N8810U-G models makes them ready for the next step in network evolution straight out of the box. And with the addition of Data Guard for local and remote backup to other NAS, and Data Burn for permanent backup to CD, DVD, and even Blu-Ray discs, you can ensure that your data’s ready for whatever the future can throw at it! High-end data centers often need a level of speed that today’s average network cannot provide.The 10GbE solution offered by the N8810U-G models makes them ready for the next step in network evolution straight out of the box. Thecus’s AES 256-bit RAID volume encryption tool allows users to fully encrypt their entire RAID volume, defending essential data even in instances of theft. 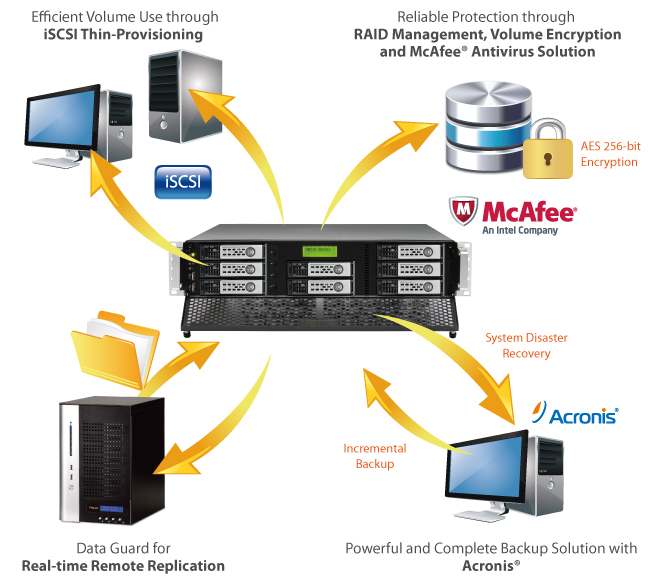 Data Guard backup solution is the ultimate software as it provides both local and remote parts. Currently, data is backed up across RAID volumes, external USB drives, and eSATA. In addition, Data Guard uses innovative technology to sync data across the network to other NAS and servers. More importantly, Thecus® Data Guard is the total backup solution which makes managing NAS user-friendly and convenient. NAS data can now be burned directly to CD, DVD, and Blu-ray discs with Data Burn, this hassle-free module makes burning data to a disk effortless. In addition, burning ISO image file is also supported. Whether you’re managing audio, media or essential files; Data Burn copies information fast while significantly reducing waiting time. The process of burning file to disk is now easy and smooth with Data Burn module. Link aggregation can sustain multiple network connections and provide redundancy in case one of the links fails. Thecus NAS supports 7 modes which provide Load Balance, Failover, 802.3ad, Balance-XOR, Balance-TLB, and Balance-ALB, Broadcast. Thecus’ innovative hardware helps prevent failures. But sometimes you have to protect the NAS against itself. Adding an antivirus to the already comprehensive software bundle will provide the necessary software protection by scanning the files on your NAS and defending it against possible threats. McAfee is the world’s largest dedicated security technology company and shares Thecus’ spirit of dedication and quality. By establishing a strong partnership with them, Thecus will allow users the benefit of McAfee’s powerful software on their NAS entirely for free. The private and public clouds meet with Thecus’ new DropBox, Amazon S3 and ElephantDrive cloud backup functionality! Guard your data with RAID at home and an additional level of protection in the Cloud. Just drag and drop files into the folder on your NAS and access them on any computer or mobile device with DropBox, Amazon S3 or ElephantDrive. Make your NAS into the ultimate multimedia hub! The N8810U-G’s HDMI output allows you to connect your NAS directly to your TV for device management. The next generation of connectivity is here with speeds 10x faster than USB 2.0. Whether connecting digital cameras and smart phones, backing up large external hard drives, or extending the capacity of your NAS, USB 3.0 will make sure it's done in no time at up to 5 Gbit/s. Backwards compatibility adds the connectivity of a world full of USB 2.0 and USB 1.1 devices to get the best combination of speed and universal access. Thecus brings the best to the table with Acronis’s advanced backup software. Back up all your data with One-click Protection or pick and choose only your most important files. Acronis sports a slick interface, user-friendly design, and comprehensive features to keep your data safe. When it comes to data management, Thecus NAS truly let you have it your way. Create multiple RAID volumes each supporting different RAID modes including RAID 0, 1, 5, 6, 10, 50, 60 and JBOD for your own balance of performance and data protection. Should a hard drive malfunction occur, changing one is simple thanks to online RAID migration and expansion, hot spare, and auto rebuild. Support for multiple file systems including EXT3, EXT4, and XFS, gives Thecus NAS flexibility to handle many different types of environments. Users can simultaneously use different file systems across multiple RAID volumes to get the best of each one. Get the most out of your storage space with the extreme speed of iSCSI and the efficiency of iSCSI thin provisioning. Connect through iSCSI for the fastest data transfer speeds available and make wasted disk space a thing of the past with thin provisioning's flexible storage functionality. In the modern world, nothing is as important as reaching your data from anywhere. With T-OnTheGo and the T-Dashboard, you can manage your NAS, and upload to and download/stream from your NAS using an iOS or Android device on the go. Backing up your data is very necessary, and everyone has specific needs when it comes to storage. Thecus’s Rsync functionality gives users great flexibility with remote backup capability, a flexible scheduler, and the stability of Linux-based transfer. Divide the massive storage of a Thecus NAS among multiple users. Whether there are two users or 100, User Quota make it easy to divvy up and manage disk space. Auto Module Installation Thecus’s module server automatically provides the latest modules and updates through the user interface.